Google and Asus are finally ready to release their new micro Chrome OS computer called the Chromebit — that retails at a great price, just $85. That is quite cheap for what is essentially a portable computer that you can take anywhere in your pocket. Also Read: CHIP — The World's First $9 Computer. Announced back in March, the Chromebit is a fully featured Computer-on-a-Stick that plugs into TV or any screen and turns it into what Google calls a "full-fledged Chrome OS-based computer." 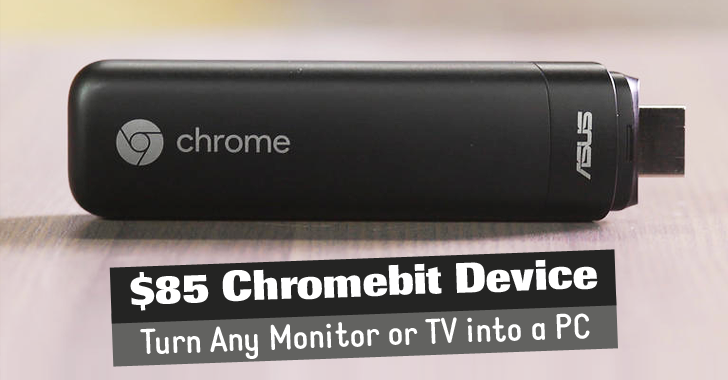 It has a smarter clinch on the business end so that you can easily plug the Chromebit into practically any HDMI port without the need for any extension cable. Also Read: Mouse Box — An Entire Computer inside a Mouse. Despite its low price of just $85, the Chromebit offers you a complete Chrome OS experience, meaning you will be able to do everything you can do on your Chromebook or your Chromebox. Chromebit is currently available in United States, Australia, Canada, Denmark, Finland, Japan, New Zealand, Norway, Spain, Sweden, Taiwan and the UK. Users in the US can get the Chrombit from Amazon, Fry’s and Newegg.